On land, Oman is an amazingly varied country. 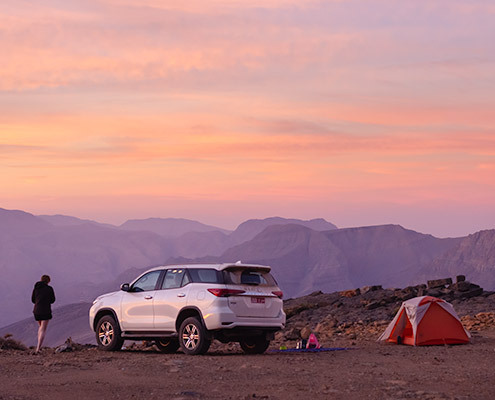 With mountains, deserts, wadis and beaches, there is no shortage of adventures to be had. The country is growing in popularity, fast becoming one of the Middle East’s most attractive destinations. But the opportunities in Oman don’t end there. 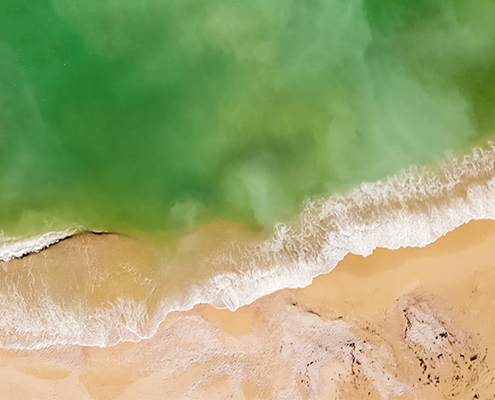 With over 2000 km of coastline fringed with warm, nutrient-rich seas, it should be no surprise that there’s excitement to be had under the water too. With coral reefs comparable to the Red Sea and an abundance of sea creatures large and small, scuba diving in Oman is an attractive prospect. Oman’s underwater realm supports fascinating life of all shapes and sizes. Whale sharks and white tip reef sharks, green and hawksbill turtles, spinner and bottlenose dolphins – the list goes on. Huge honeycomb moray eels stretch out from the reefs, and at the smaller end of the scale – among vibrant beds of bush and table coral – there’s a huge variety of reef fish, as well as macro level species like seahorses and nudibranches. As such, diving in Oman gives you the opportunity to see an incredible range of aquatic life. There are dive centres located all around Oman. While the majority of these are close to Muscat, diving opportunities can be found from Musandam in the North to Salalah in the South. 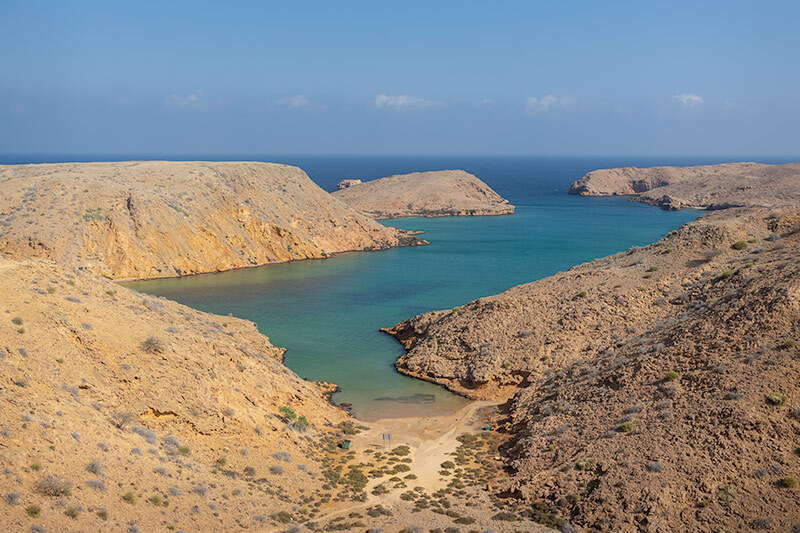 A small rocky island 4 km from Muscat, it’s also known as Shark Island on account of the black tip reef sharks that cruise the shallow sandbanks. The reefs here are incredibly varied, featuring every type of coral found in Oman. Large schools of fish swim by and the coral gardens are abuzz with life. 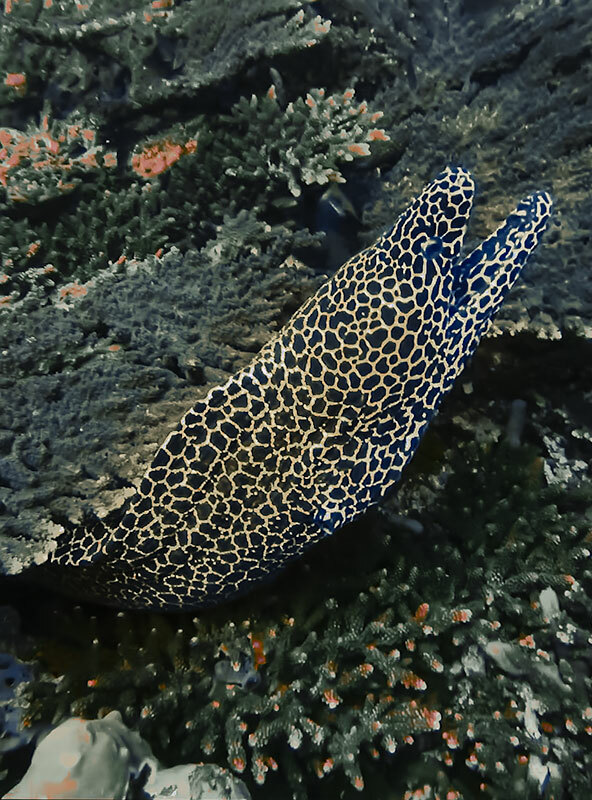 Honeycomb moray eels sway back and forth hypnotically, and groups of mobula rays can be seen demonstrating amazing acrobatic feats. The calm waters around Fahal Island are suitable for divers of all levels. 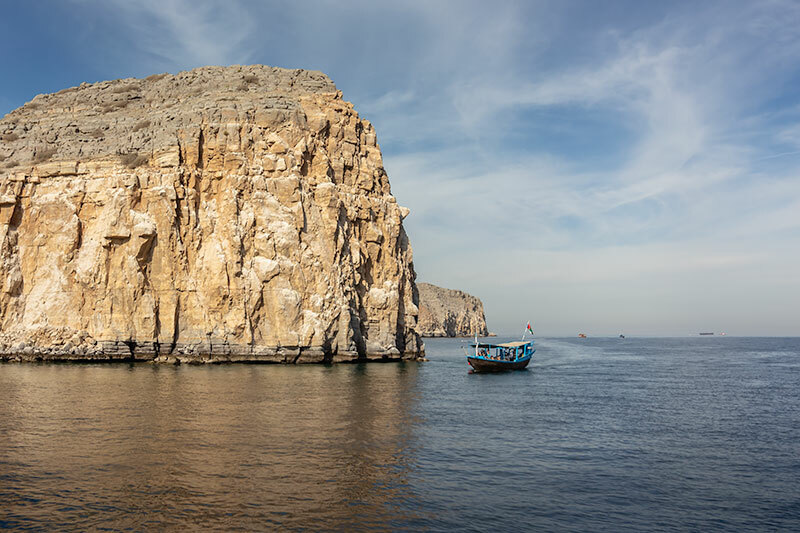 Another location close to the capital, just 25 km from Muscat, Bandar Al Khairan features many different dive sites strung together along a dramatic coastline, where distinctive limestone cliffs descend to the water in well protected small bays and coves. Like Fahal Island, shallow coral reefs are teeming with colourful fish and home to more massive honeycomb moray eels, and the calm waters make the dive sites of Bandar Al Khairan suitable for all levels. They are easily accessible by boat and are well serviced by Extra Divers Qantab. Al Munnassir is the wreck of a 3,000 ton navy landing vessel, scuppered by the Oman Navy in 2003 to create an artificial reef. Just a little further down the coast from Bandar Al Khairan, the wreck has become a complex ecosystem in a relatively short time. It is known as one of the best places to see nudibranches, and is home to seahorses and many varieties of soft coral. To dive the Al Munnassir, advanced open water certification is needed. These UNESCO protected islands are regarded as the very best place to dive in Oman. An hour and a half by boat from Muscat, they are home to turtle nesting beaches, rare marine birds and immaculate coral reefs. Indeed, the densest nesting grounds in the world for hawksbill turtles are found here. The underwater environment is truly unspoilt and the nutrient-rich waters attract an abundance of sea life, including whale sharks late in the year. There is diving to suit all levels. Forward planning is required due to permit restrictions and minimum numbers required for the trip. Additionally, the area is often at the mercy of weather and sea conditions. Surrounded by the warm waters of the Indian Ocean and Gulf of Oman, Musandam has an incredibly wide biodiversity of marine life. This area is often described as the ‘fjords of Arabia’, with its long brilliant blue inlets bordered by steep-sided mountains, an ancient seabed thrust from the depths. 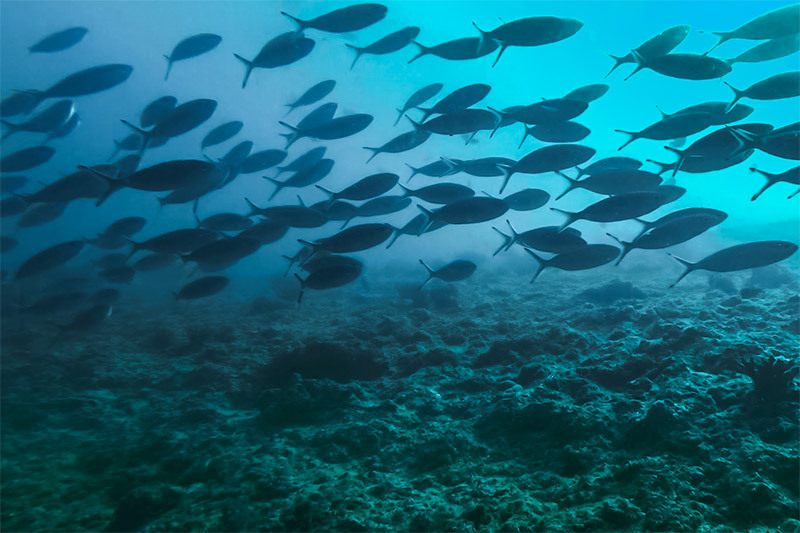 Underwater, the unique deep drops‐offs and upwelling of cool water provide an abundance of plankton, making it a rich feeding ground for a huge variety of species. Dive sites in Musandam are accessible from Khasab or Dibba and are suitable for divers of all levels. 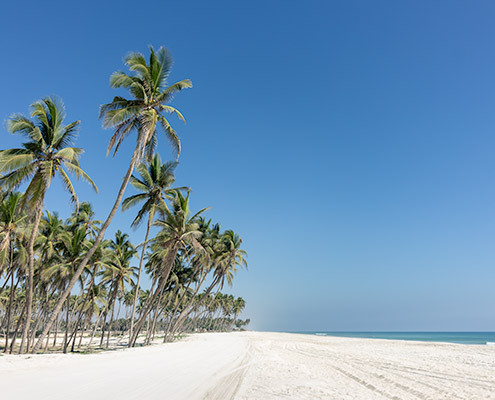 In the far south of Oman, the area around Salalah is like no other. During the summer months, a monsoon known as the khareef sweeps in from the Arabian Sea. Below the surface, cold swells and falling underwater temperatures brought by the khareef make this one of the few places in the world to dive among both coral reefs and kelp forests. With colder water and rougher seas, the marine life is also significantly different. 22 species of whales and dolphins cavort in these waters, and it’s not uncommon to dive alongside huge humpbacks or acrobatic spinner dolphins. Around 20 dive sites are covered by dive centres such as Extra Divers Mirbat. The conditions make diving here more suited to experienced divers. WANT TO SEE ANOTHER PLACE TO DIVE AMONG BOTH CORAL AND KELP FORESTS? It’s possible to dive all year round in Oman, except in the south where diving is suspended from June-Sept due to the monsoon conditions. In the Muscat area, the best times temperature wise are April-May and Sept-Oct when the water hovers around 28-30°C. In the winter months Jan-Feb, temperatures can dip down to 23°C. When we dived near Muscat in late November, temperatures were a pleasant 25-26°C. Around Salalah, the monsoon flips water temperatures on their head, being at their lowest during the summer monsoon. Temperatures rise to around 28°C in October before cooling again over winter and rising again in spring. 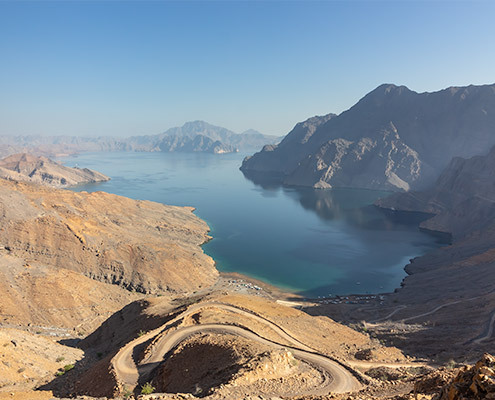 In Musandam some of the widest ranging temperatures can be seen, swinging from 32°C in summer to 23°C in winter. The best times are April-May and Sept-Nov.
For more detailed Oman water temperatures, click here. 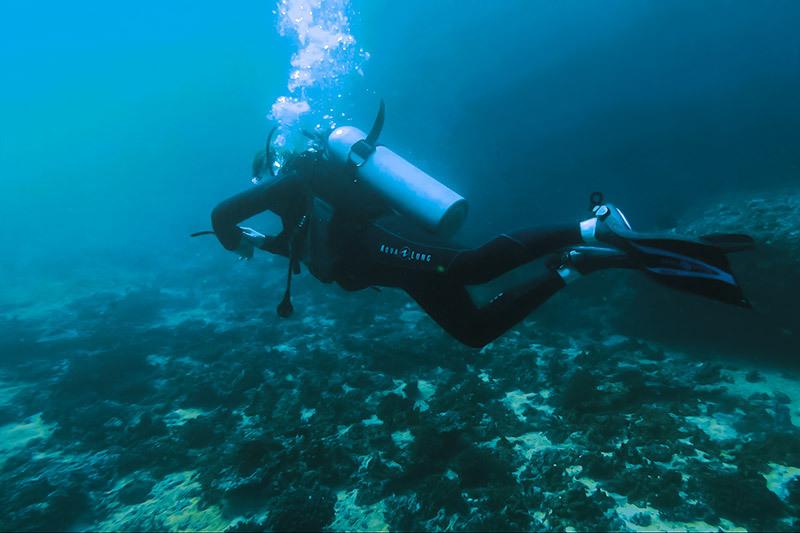 Regions and dive sites can vary greatly but expect visibility to be between 5 and 30 metres. Visibility can sometimes be reduced due to nutrient blooms. The upside however is that such blooms attract large shoals of fish. Visibilty is said to be best in May. Perhaps the biggest seasonal draw when diving in Oman is whale shark season. The best time to see the world’s biggest fish is from Sept-Nov with the Daymaniyat Islands being the prime location. The kelp forests off the south coast are the other major seasonal variation, with Oct-Dec being the best time for these. The cost of scuba diving in Oman can vary depending on a couple of factors: location and the type of trip you plan on doing. If you’re diving around Muscat or Salalah, then the cost of a day trip is fairly similar. However, prices for a day trip from Dibba in Musandam can be double. If you’re interested in a liveaboard, then as you’d expect, these trips can be very expensive. The cost of diving in Oman isn’t always immediately apparent when researching where and who to dive with. For example there are plenty of dive centres in Khasab, but prices are not displayed on their websites so you’ll have to get in touch with them directly. By far the most transparent are the four Extra Divers dive centres. They provide a full list of costs and packages on offer. What’s more, as part of a worldwide organisation you can expect their equipment and facilities to be of a good standard. Prices for a two dive day trip range from 33-41 OMR around Muscat and Salalah, with full equipment rental from 15-17 OMR. 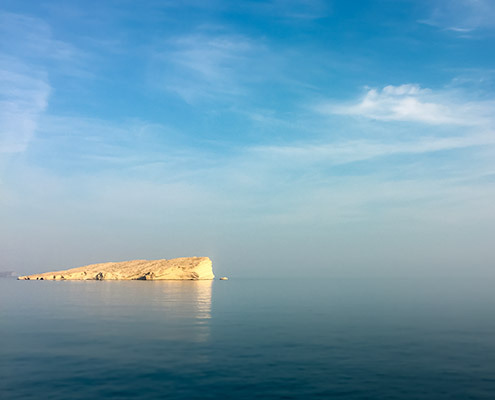 A compulsory dive permit of 4 OMR per day must be paid regardless of location, with a further permit needed for trips to protected areas like the Daymaniyat Islands. 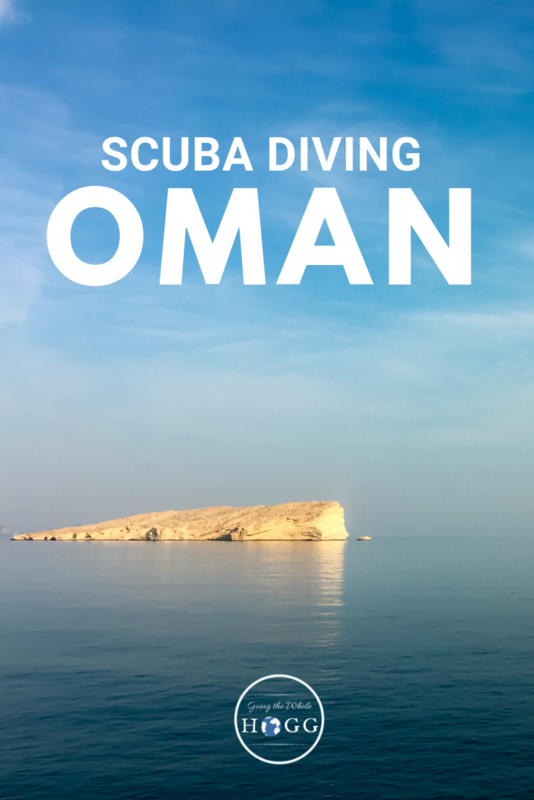 It’s possible to dive in Oman without a guide as long as you have enough experience and dive in a buddy system. As such, prices for a guide are often separate so be sure to check this when booking. If you’re interested in the liveaboard experience then there are a few options. Traditional dhow boat trips in Musandam range from $1400 for a 7 day trip. 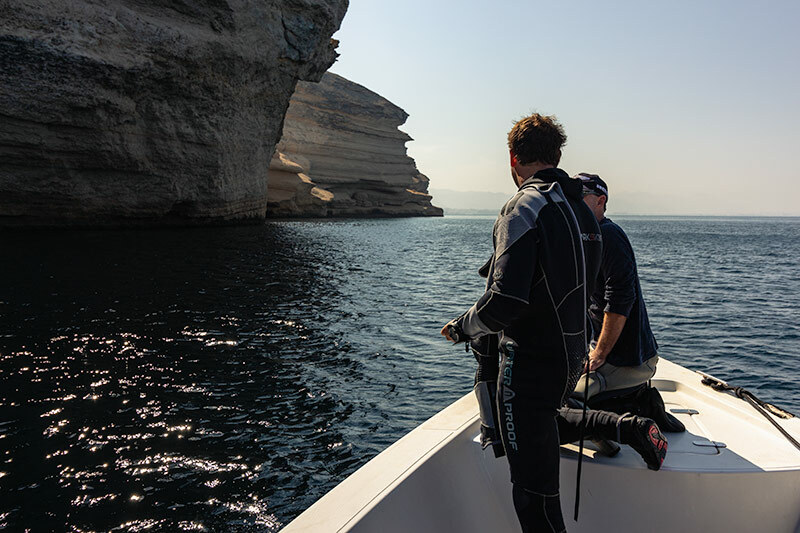 More high end options like the Oman Aggressor start from $2999, with possibilities to dive in Musandam, the Daymaniyat Islands and/or the Hallaniyat Islands in the south. If like us you want to combine scuba diving in Oman with a journey around the country, then a two or three dive day trip might be just what you’re looking for. At the start of our month long Oman road trip, we had what turned out to be a couple of really nice dives. Just half an hour from Muscat, Extra Divers Qantab were on our radar. They covered a wide range of good looking dive sites and their pricing was reasonable and readily available. We also managed to sandwich the dive day with two of our favourite wild camp spots. 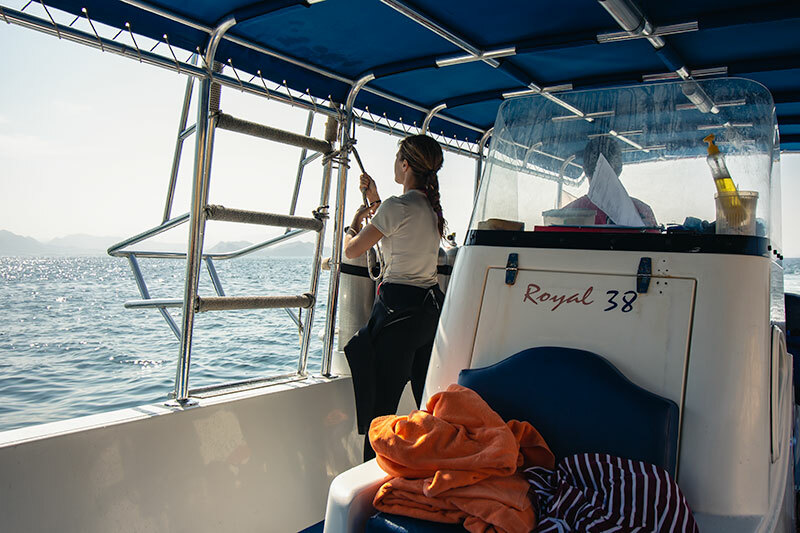 Our excellent dive team took us on the 30 minute speedboat ride to Fahal Island, cruising past dusty orange limestone cliffs and the harbour at Muttrah. The visibility was down to around 5-10 m but the water was calm so we quickly relaxed into the dive. 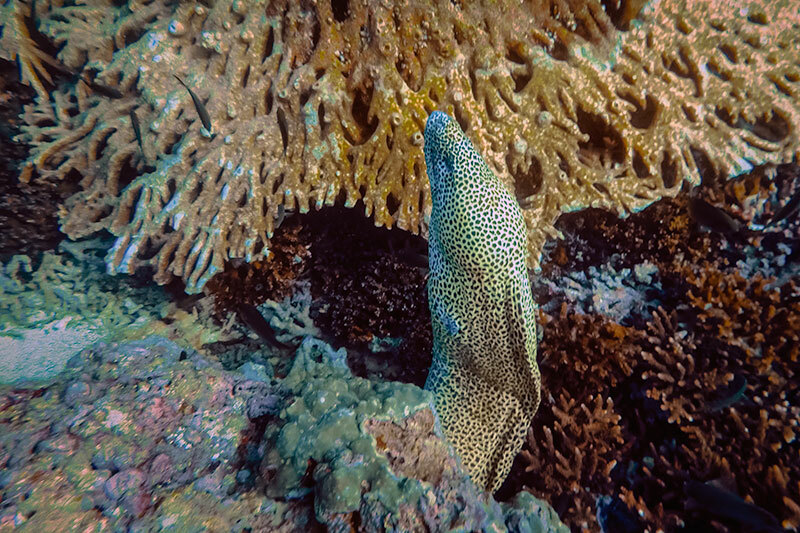 Drifting past the extensive coral gardens, we soon lost count of the huge honeycomb moray eels. Their giant mouths hung wide open, heads swaying and bodies slithering beneath the coral. 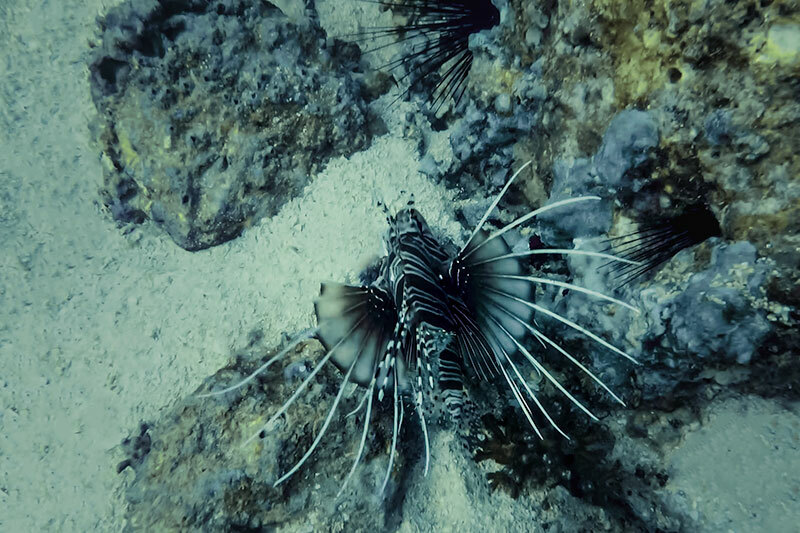 Lionfish appeared time and again, hovering gracefully above the sea floor. Towards the end of the dive we came upon a cuttlefish. Staying a few minutes, we watched as its skin pulsed, colours changing and shifting. After a little rest and rehydration we plunged back in the water. This time there was a small current but the visibility was better and life was all around us. Cruising past soft purple coral and various types of stag and table coral, so many brightly coloured fish swam here and there. A school of barracuda caught the eye and we stopped at more than one anemone to be entertained by the protective clown fish. We encountered more lionfish, a variety of scorpionfish, and even a cheeky lobster, antennae poking out from its cave. As we neared the end of our hour a massive porcupine fish was spotted, lurking beneath an overhang like some dull-eyed brute. Back at the surface, we were delighted with what had been a fantastic dive, packed with a wonderful array of marine life. Our experience with Extra Divers Qantab couldn’t have been better. We were impressed with their professionalism and the level of service provided. Everything was taken care of down to the smallest detail, and the dive equipment provided was in excellent condition. They helped to make our dives fun and comfortable – something we valued as it had been over a year since our last dives. The combination of service, equipment, location and dive sites make Extra Divers Qantab a great choice for scuba diving in Oman. 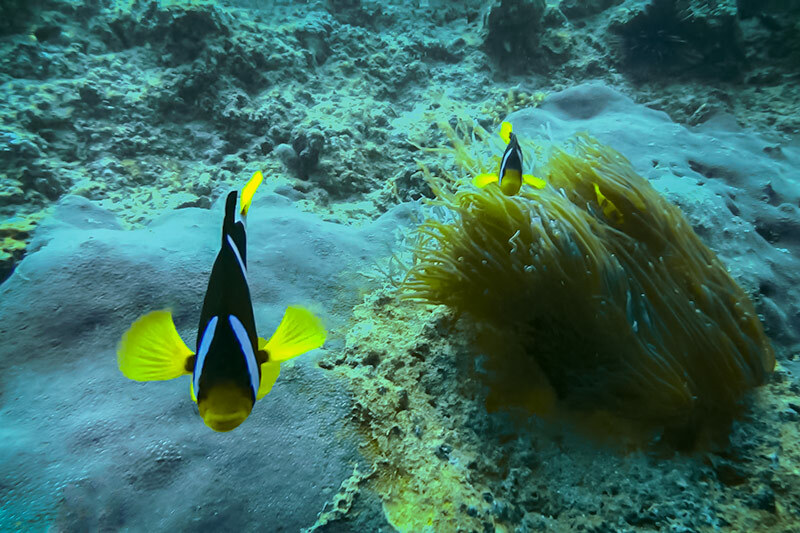 Diving in Oman offers excellent opportunities to see a wide range of fascinating marine life. The reefs are in great condition and the small numbers of people diving mean that it’s never going to be crowded. When you combine it with a longer trip around what is a truly stunning country, it really is a no-brainer. We dived courtesy of Extra Divers Qantab. All thoughts and opinions are of course our own. Want To See More From Oman? Still Not Sorted Your Travel Insurance? Have you been diving in Oman? Share your experiences in the comments below!